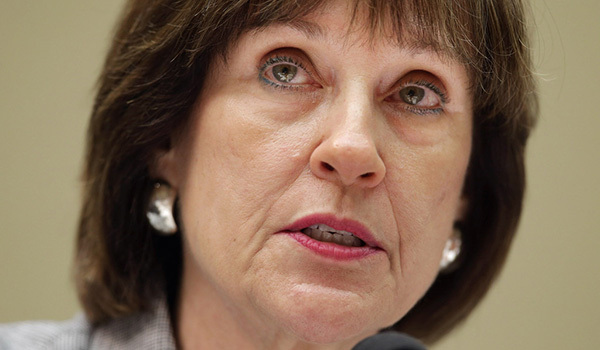 Lerner, who was placed on administrative leave and has since retired from the IRS, made a mistake in her strategy before the committee, however, by giving an opening statement in which she declared her innocence, which, the committee determined, constituted a waiver of her rights. The House of Representatives, in May of this year, held in Lerner in contempt. Until just recently, Lerner, who sought help from the Justice Department to prosecute nonprofits and called conservatives "a**holes" and "crazies," had been remarkably silent, speaking only through her attorney. She did defend herself in an interview with Politico, in which she, once again, declared that she "didn't do anything wrong" and is "proud of [her] career." Though she told Politico that she won't hide from the criticism, Lerner sought shelter at a neighbor's home when conservative personality Jason Mattera visited her neighborhood to ask questions about the IRS scandal. The video, released on Monday, shows Mattera approaching Lerner, who, rather than give answers or apologize for her actions, knocked on her neighbors door and begged to be let inside. "Could you call the police?" Lerner asked her neighbor, who refused to let her in her home. "Please let me in. These guys are with the press and they’re not leaving me alone." "Why should we leave you alone?" Mattera asked Lerner. "You were trying to use the IRS to crush political dissent." For someone who claims that she did nothing wrong, Lerner certainly doesn't want to talk about her central role in the IRS scandal, whether the questions are coming from House investigators or someone like Mattera. In her mind, she's the victim, not the more than 200 conservative organizations the tax agency unconstitutionally targeted on her watch. After the midterms, we will know of extent of corruption, and crimminality wreaked on private citizens -- most will be conservatives.